So, how are you making out with your 2016 New Year’s Resolutions? I have been really focused on eating cleaner and found it really easy to do this week even though I was back at work. Now, it is the weekend and I have more time to think about all the really bad (but tasty) processed foods and sugary baked goods. In fact, I’ve had a hankering for an apple fritter or a big slice of apple pie since I walked by a Tim Horton’s earlier today and I swear I could smell donuts coming out of the oven. If I’m going to make it into week two and beyond, I will need to find ways of getting the satisfaction and taste of some of my favourite foods but without the processed and/or refined sugars. Luckily, an apple pie smoothie is an easy way to curb my cravings today. Smoothies in general can be made to mimic some of your favourite foods. 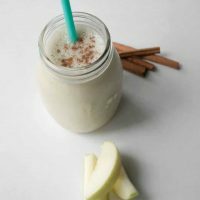 To me apple pie is all about the apples, cinnamon, nutmeg and vanilla and this is so easy to add to the blender and mix up. I like to use granny smith apples because of the crisp, tart flavour but you can swap out for your favourite apple. Leave the skin on but remove the core and seeds. 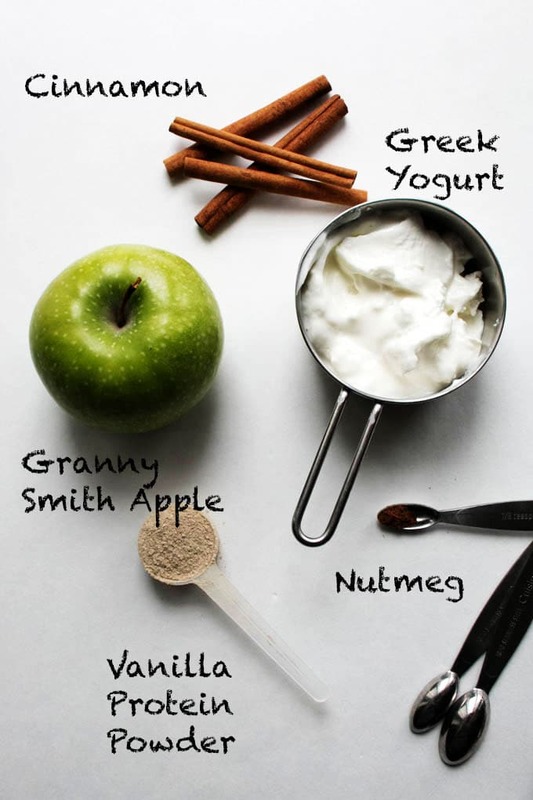 Add the apples, greek yogurt, spices to the blender with the milk of your choice. I chose to use vanilla almond milk to give that hint of vanilla along with vanilla protein powder (optional). Blend it all up and then add ice and blend again. How easy is that? Way easier than baking a pie if you ask me. 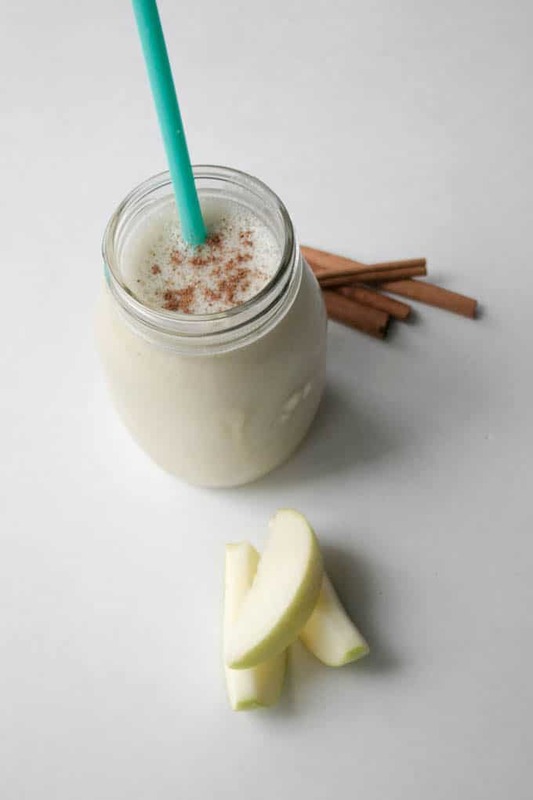 Apple Pie Smoothie in 5 minutes, Apple Pie in 1 hour 20 minutes. Plus easy clean up. Win/Win to me. 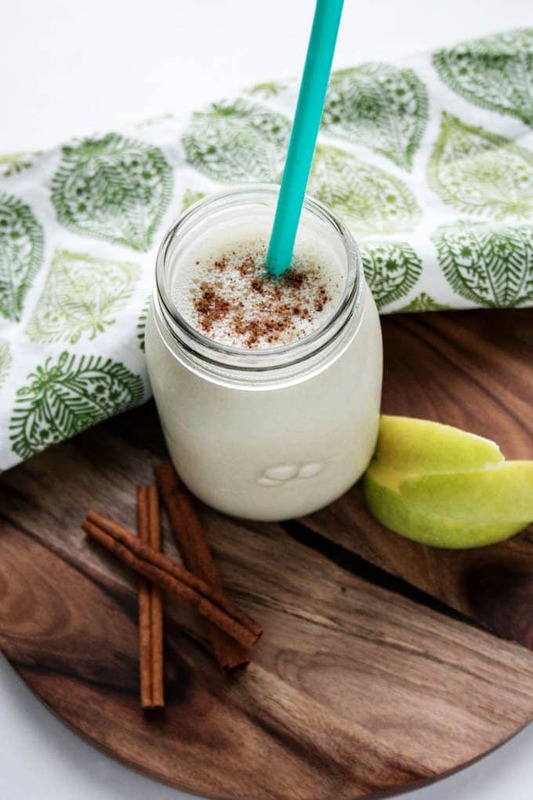 Satisfy your apple pie craving with this apple pie smoothie. Add all ingredients except ice to the blender. Mix, starting on low variable speed and slowly increasing to variable speed 8. Blend until smooth consistency and then add 1 cup of ice. Blend again. Serve and top with additional cinnamon. If you don't have any ground cinnamon you can use cinnamon sticks and grind with a microplane. Yum! Smoothies are my go to breakfast. Apple pie …mmmm. Love it! Thanks Amanda. This is one of my all time favourite smoothies.